S2S Dual Sit-Stand Workstation is the only ergonomic rear-mounted sit-stand height adjustable workstation that meets the ANSI/BIFMA and HFES 100-2007 requirements that meet the 22" height adjustment. 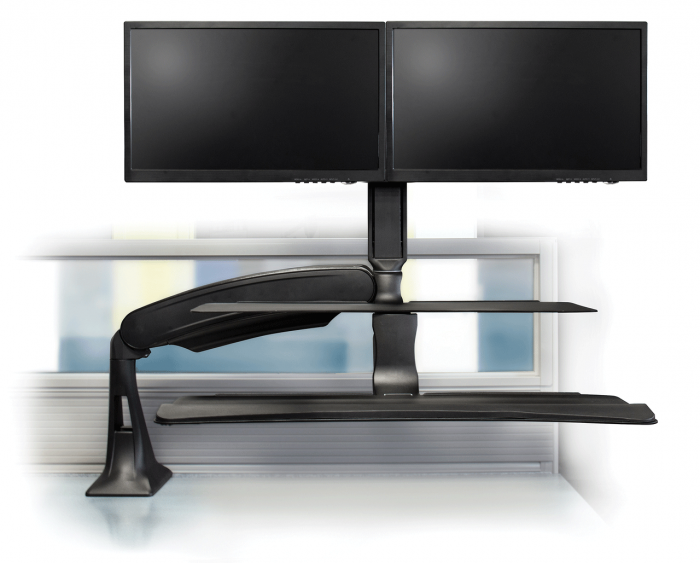 Introducing the S2S Dual LCD Sit-Stand Workstation that will allow users to adjust their work surface to an ergonomic seated or standing position in a smooth and effortless motion. This adjustable bracket supports most 24” monitors weighing up to 8 lbs each and offers independent screen adjustments including tilt setting as well as portrait to landscape positioning. Experience S2S workstation with a dual monitor application allowing for simultaneous, parabolic viewing of both screens. Beautifully designed, the Dual Screen S2S will complement every working environment and provide a comfortable and healthy environment for every user. With over 22” of gas assisted positioning, the S2S moves easily and effortlessly as users transition from seated to standing positions. Accommodates users ranging from the 5th percentile seated female to the 95th percentile standing male. The S2S cleverly mounts at the rear of the work surface and extends forward so the keyboard tray may rest below the desk surface supporting proper ergonomic positioning. Using this location for mounting allows the user to swing the unit out of the way leaving the desk surface fully accessible. Comes with 9.5” of counter balanced height adjustment, 45° of tilt, and 90° of portrait to landscape rotation, monitors may be ergonomically positioned for optimal viewing. The S2S accommodates installed technology ranging from 5 to 25 lbs, specifically supporting LCD screens that weigh between 5-20 lbs. The grommet mount included with the S2S Workstation promotes endless possibilities for mounting locations, through the installation of a 5/8” mounting hole. The c-clamp mount that is also included allows the dual directional base to be installed on either 24” or 30” deep work surfaces. The integral dual tray system offers a spacious keyboard and mouse platform with an adjustable tilt mechanism for comfort settings, as well as a secondary surface for placing items which need to remain close at hand while working in either a seated or standing position. Information sharing is seamless as the monitor tower rotates independently from the work surface through 180° left and right range. Tested to 20,000 cycles (with the exception of the monitor tower which is supported up to 10,000 cycles) and comes with a 5 year warranty. LEED Recyclability Calculations - Total Weight 36.04 lbs (Recycled Content Total 19.6 lbs, Post Industrial Total 11.6 lbs, Post Consumer 7.97 lbs). 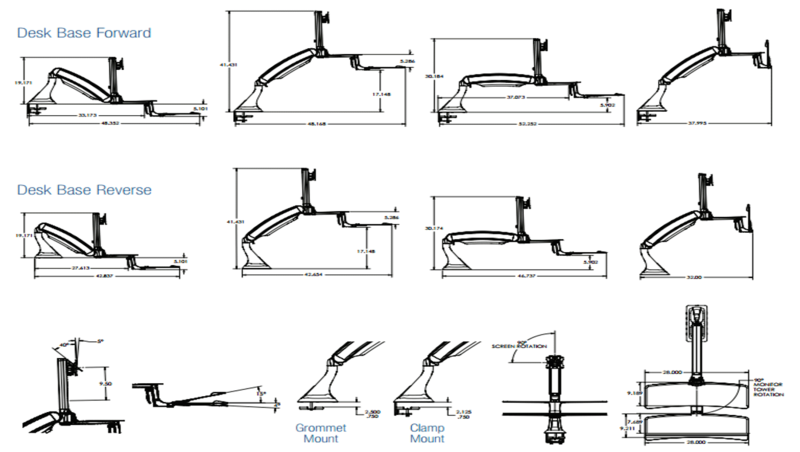 NOTE: Need Minimum 24" table top depth to mount to table top for C-clamp or hole to mount base.